At 11pm, while I was studying for my GRE and my biology final… simultaneously, the power went out. Sure, it happens quite often, often enough that it doesn’t really surprise us. Our Lebanese post-war reflexes kick in: open the front door, press the elevator button to see if the entire building is also in the dark (because surely you don’t expect to have the AC, washing machine and dish washer on at the same time and STILL have power!). Then you go to the kitchen and retrieve alternative ways of illumination. Candles. For the more sophisticated people, rechargeable neon lights. Then, you wait. 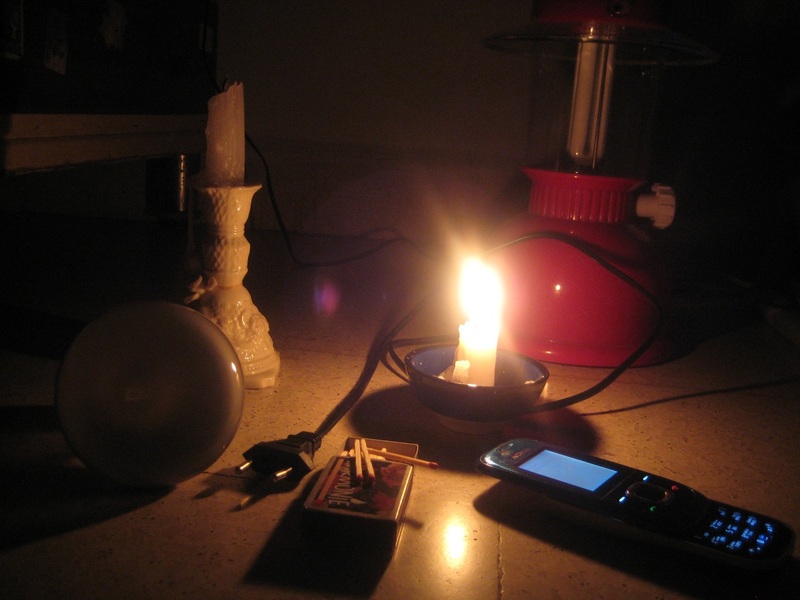 Sometimes the power goes back on a few minutes later, and it would’ve been a little wink from Electricité du Liban, making sure you stay on your toes. If you’re in the dark for more than this time interval, you assume the worst: “3otol”… Houston, they have a problem! Then, it becomes a matter of gauging how long it will take for them (we don’t really know who “they” are) to fix it. For those of us who maintain the will to live in the AC-less heat, we go to the phone and call this so-called Electricité du Liban. A building that, if drawn by a modern painter, would boil down to an empty canvas. You dial, 1707. You hang up then dial again, and again, and again. You get busy signals all the time. You then devise a clever system of redialing by just pressing two buttons, to minimize movement and therefore maximize ventilation… a strategy that got us through the war. FINALLY, the heavens open, the angels gather and sing, your exhausted sweat glands perform little cartwheels: THEY picked up!! *waiting music* Of course, you should’ve known better, they put you on hold. Now, this is where it gets interesting. After a while, you realize that you’re listening to the music of Frank Sinatra’s “I did it my way”. Yes, the “on-hold music” of Electricite du Liban is “I did it my way”. An omen? A sign foretelling what is yet to come? THEY answer: “Fi 3otol.” (DUH!) “ma mna3ref 2emtan bi zabtoo” (min henneh?!) “ma 3andeh 2ayy fekra shou 3am bi seer” (join the club and thanks for nothing!) “Allah ma3ek madame…”* (MADAME?!!! Sure, add insult to injury, to sweat, to despair and darkness).